Last year, in my inaugural season as editor of the Hail Pelicus, I offered up many viewpoints and observations, peppered with jokes and psudo-classical references. Based on the response, one of the most evocative pieces I wrote was after the Cal – St Mary’s game that was handily won by the Gaels, a result that surprised many but not all, especially those who have been paying close attention to collegiate rugby in the USA. I dubbed it the Most Significant Game Of The Year and went on to make my arguments, even going so far as to suggest that I may have understated it. (You can find the whole article at http://pelicanrefs.com/news/page/4/ should you wish to refresh your memory.) Cal has been the dominant force in US collegiate rugby for decades and have often taken on and beaten the top club teams as well, staking their claim to being the top rugby program in the country period, yet this time Cal was the underdog at home – a clause that is rarely typed when dealing with American colleges. I was fortunate enough to be assigned to AR the match and for the first time I was able to directly witness this rivalry. In college in the early 90s I played against Cal in the old Pacific Coast playoffs and lost, but we weren’t blown out. This, however, is a whole different animal. Since then Cal has taken to heart the philosophy of High Performance training and has made a habit of beating teams by upwards of 80 points, often over 100. When I was in college I also played against St Mary’s in a preseason friendly, and in fact we won. This also is a whole different animal, as since then the program has improved to the point where they are now staring down Cal as equals, and often, betters. The quality of the rugby and the enthusiasm of the crowd, combined with the Pac 12 Network televising the game live, is what we all dreamed of back in the day and I feel privileged to have witnessed it first hand. Say what you like about Cal, and many people do, but they know how to put on a show and manage a production. It is the most professionally run venue I have ever been a part of at any level, and St Mary’s stepped up and matched Cal on the field, a most worthy opponent. I feel I nailed that one. Not many other Local Unions get that in a year. It is rather commonplace here in Pelicanland. Make no mistake, though, because we know what we have here and are very appreciative of it. Visiting referee from Virginia Rugby Referee Society: Patrick Benner from Richmond, Virgina. Hosted by Kevin Donnelly and Bruce Bernstein. Friday 27 March. Many thanks goes to Bruce “Dude” Bernstein for meeting Patrick at the airport at Friday noon and entertaining him until early evening, including a personal guided bicycle tour of the Golden Gate Bridge and surrounds. Patrick, being on Eastern Time, was exhausted by 10pm and retired. Saturday 28 March. We made our way from Palo Alto to Napa on Saturday morning for the scheduled Men’s D3 festival, stopping along the way for a suitable pre-game brunch. Patrick willingly ran touch for other games during the midday and early afternoon prior to his scheduled match at 4pm. His game between Aptos and Marin was a one-sided affair (Marin 71 – Aptos 0) but the rugby was fully contested and Patrick showed good judgement and pace to manage a run-away game of that type. An official evaluation was tendered by Lee Johnson (many thanks to Lee). It is notable that as a referee with about 18-months experience, Patrick showed maturity and resolve by promptly ejecting a verbally confrontational coach from the enclosure within the first five minutes of the game! The outdoor festivities that followed the day of rugby were enjoyed by all, Patrick was awarded a festival t-shirt and bottle of Napa wine (what else would you give an exchange ref?). We ended the day later with fine dining in downtown San Francisco. Sunday 29 March. As an additional aspect to the exchange weekend, we lined-up Patrick for an AR role in the team-of-four that officiated the youth international touring-side match at SFGG between the England U-19 Lambs and the NorCal U-19 Select Side. With all the trappings of an official international rugby event, a pre-game team speech by the NorCal captain that included something about throwing tea into a harbor, beautiful weather, Pete Smith in the center, and a hard fought game; it was certainly an experience for all involved. To boot (excuse the pun) NorCal come away on-top by surprising the English lads with ferocious tackling and a physicality in the loose play that they clearly did not expect. The Lambs players and staff were gracious in the post-game ceremonies and many new friendships made. A good day for US rugby, NorCal rugby, and the Pelican Society for providing such a unique opportunity for an exchange referee. We finished off the evening having Patrick out to dinner in the coastal town of Pacifica to enjoy a West Coast sunset before putting him on his 11pm red-eye flight back east. Patrick was a credit to himself and the Virginia Society, and he was a superb guest for the entire weekend. Thanks again to the hosting coordinators – Bjorn Stumer and others. EDITOR’S NOTE: From being copied on the email exchanges it looks like Kevin has a new BFF. Exchanges change lives! “What’s in a name? That which we call a rose by any other name would smell as sweet. So learned man and womenfolk would, were they not Evaluators call’d, retain that dear perfection which they owe? Oh no, Mr Bill, you are spot on there. This is an issue that has plagued us here at the editorial staff of Hail Pelicus as well – we are just coming to terms with Assistant Referee and Touch Judge. With nomenclature changing all the time it is sometimes difficult to know what the currently accepted titles are for the people who are watching and (officially) judging a referee’s performance. Is it Evaluator? Performance Reviewer? Sometimes a Referee Coach? In order to come up with a standard we here at HP have decided that for the next several weeks we will make up some titles and throw them out there to see what the public thinks. There were several matches watched this week so see if you can spot the new titles and let us know here at hailpelicus@pelicanrefs.com which ones you think are the best. Results will be tallied and published at the end of the year. My relocation to New England can now be considered complete after I have been activated by the New England RRS. I understand from reading Hail, Pelicus! that there seems to be a difference in the weather from Northern California to Rhode Island. You didn’t also get 65 inches of snow this winter? Hmm. Interesting. Please accept my match report so as to enlighten the left coast on the trials and tribulations of New England rugby in the springtime. A capacity crowd, glorious sunshine, TV cameras, and all the hoopla that comes with this most intense local rivalry awaited us at Witter Field. Festooned with antennas and microphones, I was joined by James and Rob for the anthem, then once the PAC-12 Network commentary team had completed their pre-match commentary, we got the signal to kick off. The physicality and pace of the match was everything you’d expect from two gifted teams fighting for bragging rights. St Mary’s drew first blood in the 8th minute, banging over a penalty after Cal took a scrum down. With St Mary’s lineout misfiring, Cal had a surfeit of possession, and tied the game up after St Mary’s infringed at a breakdown in their own 22. Ten minutes in, 3-3 score line. Cal had a number of attacks thwarted by St Mary’s vigorous and scrappy defense, or squandered as the ball was lost, before Cal’s scrum half Bosco darted in on the right corner after a series of phases in St Mary’s 22, with 26 minutes played. The conversion drifted wide, and Cal led 8-3. St Mary’s riposte included an incisive sequence of runs linked by offloads driving deep into Cal territory, only for the final pop pass to go straight into Cal hands, and the opportunity was snuffed out. Only for a moment. Fielding a ball deep, St Mary’s lethal fullback and captain Cooper Maloney accelerated through a gap between two defenders, broke a tackle, somehow kept his feet under him when he looked certain to fall, and scored to tie it up at 8-8 with eight minutes remaining in the half. The conversion sailed over and took St Mary’s to an 8-10 lead. The ensuing restart kick was spilled by St Mary’s but they recovered to push downfield and a Cal infringement at the breakdown gave St Mary’s the chance to stretch their lead to five points, with a handful of minutes left before the break. Cal pummeled the St Mary’s defense but the pressure came to naught when St Mary’s held on. Right at the end of the half, St Mary’s infringed deep inside their 22, but Cal’s kick missed right, and St Mary’s carried their 8-13 lead into the break. Cal closed to within two points with a penalty kick early in the second half as St Mary’s had hands in a ruck, but St Mary’s struck a hammer blow a few minutes later. St Mary’s #8 picked up from a scrum just outside Cal’s 22, #9 Holden Yungert whipped a short crash ball pass right from the following ruck, whipped another left from the next one, and when the ball carrier was hauled down on the Cal 5m line, Yungert saw a gap as Cal drifted to cover the narrow side, and darted for line, somehow grounding the ball despite the two Cal defenders hanging on to him as he crossed the line. A successful conversion, and St Mary’s had their largest lead of the game at 11-20, with 7 minutes of the second half gone. For the next ten minutes, Cal hammered at the door. Salaber had a strong run only to be hauled down in the St Mary’s 22. The ball was spun wide to the right, and after a phase or two held up short of the line. Back for a penalty for a high tackle close to the St Mary’s 5m line. The ball is sent left, only for the last Cal pass to go astray as the try line beckoned. Cal kept knocking at the door. Finally, from a line out on the St Mary’s 10m line, Cal went left, recycled and went right, with Jake Anderson putting lock Kondrat into space between two St Mary’s defenders for the score wide on the right. 16-20, with the conversion going wide. 4 point game with 20 minutes left. Cal closed it to 19-20 in the 65th minute, after Yungert was offside at a scrum. Moments later, St Mary’s lost the ball in contact when an offload a fraction of a second earlier could have put Maloney through again. Cal’s Adolphus chipped into space, regathered his kick, straightened his line to stand up the defense, and slipped a pass to Battaglia on the wing, who beat a tackle, fended the next defender and…. James “I don’t need ‘go faster’ stripes on my shorts” Hinkin lent credibility to his many prior tales of winning matches in his playing days by dint of his lightning acceleration as he shot down the touchline to be well positioned as Cal winger Battaglia touched down With James’ confirmations, the try was awarded and Cal was back in front 24-20 with 13 minutes to play. Cal pulled ahead to 27-20 with 6 minutes remaining after a successful penalty kick. St Mary’s drove close to the Cal line and came within a few meters, but Cal held on for the win. Thanks to both teams for an exciting match which thrilled the capacity crowd and kept the drama going to the very end. Thanks to James and Rob for their help on the touchline, to Bruce and Ron for their service as #4s, to Scott for his insightful observations following the match, and to NCRRS for the wonderful opportunity to referee these two great teams at such a storied venue. After the thrilling match between the A sides this was a bit of a let down. Cal showed why it has remained a power for so many years and that is their depth. There are teams that can suffer a few key injuries and it will devastate their season but Cal has the horses to step into any gap. A dominant Cal scrum set a platform for attack that came in waves. St Mary’s has some very good talent that could easily slide up to the A team, but not across the board. They made some great plays and key breaks, but were only able to cross the line late for a consolation try. The key difference was the support level enjoyed by the Cal runners was not available to the St Mary’s ruggers. Great thanks must go to Neil “I Love My Go-Faster Shorts” MacDonald for manning up (or is that Scotting up?) and ARing for this match after refereeing a tense A side match. Many would have taken their well earned rest but Neil was Jocko-on-the-spot and was of great help, especially on a footrace to the try zone near his touchline when we had, nearly word for word, the exact same conversation as occurred 45 minutes prior, only with the roles reversed. A great day for rugby, if you were not in attendance. In hindsight it may have been better to postpone this friendly match. The cold, damp wind howled off the bay to add even more chill to the near completely saturated field. Maybe it’s the seven years in Northern California that has tempered my tolerance for such conditions? Either way, both teams seemed eager to get started, until we got started. The shallow pool otherwise known as a rugby pitch soon turned into a mud pit suitable for an organic pig farm. I say organic due to the copious amounts of goose droppings that may soon add infection to the open flesh wounds awarded during play. Somehow, someway, there were ample ball handling skills, rucks, mauls and other rugby like encounters occurring between scrummages and lineouts. Kicks headed for touch were blown back in. Kicks headed for posts were blown back out. Drop kicks for restarts rarely found the 10m line since no ball can drop and bounce out of 6 inches of mud. The players eventually gathered their senses at around the 60 minute mark and asked for only 5 minutes more of suffering. Newport scored a try within 90 seconds of that request, which then ended the match, no conversion attempted. The match was pushed back 15 minutes for start at the request of Aptos due to player shortages and concern that they might not arrive by the set kick-off time of 4pm. Aptos also requested open/rolling subs, which was agreed to by the Marin captain and Coach. The pace of this match was quickly set by Marin. As they were a much more prepared and established side they set their platform early and struck at each opportunity given. Their strength in the pack was also very evident resulting in much stolen ball and the ability to utilize their loose forwards to advance play at the perimeter of each scrum, particularly the 8-man. While the players of Aptos never gave up and never conceded a tackle or try, they were overpowered and outmatched in this affair. I applaud the Aptos players for their fortitude and the competition the continued to display at each tackle zone and set piece. However, the platform and game plan that Marin had established early on served them well as they continued to strike in close to collapse the defensive line of Aptos only to result in the ball being spun out to the backs for breakaway scores that always had the needed support. Despite the score, this was a contested match that drew a lot of attention at the end of the tournament. Well played by both teams and well fared by both captains. The English side was large and imposing. Based on a conversation I had with Nigel Melville about them earlier in the week, I expected them to pick the NorCal Pelicans apart. NorCal was able to match their size up front, but was much smaller throughout the backs especially compared to the huge right wing the lambs had on their side (the player is a certain England National team player). The game was close throughout played between the 22’s. NorCal had 2 penalty kicks to England’s try 6-5, England scored again to make it 10-6 and NorCal scored a try just as the half was ending to go up at the break 11-10. NorCal scored another well earned try to go up 16-10 for most of the second half and their relentless defense kept the Lambs off the board for the second half. England had their chances, but untimely mistakes and cynical penalties were their undoing. NorCal added another try with 3 minutes left in the game to push the score up to a more flattering 23-10 and walked off the field with a well earned victory. From a referee perspective, the first half was smooth sailing with virtually no issues. For some reason in the second half, the English team went to a tactic at the tackle that I am still shaking my head over. They would arrive at the tackle/or the tackler would quickly get to their feet and place their hands on the ground past the ball and ball carrier making no attempt to play the ball (in my mind this is sealing and/or going off your feet), then they would wait for contact (ruck) and then they would make an attempt to play the ball (hands in the ruck). When I talked to their captain and tried to clarify what I was seeing and subsequently calling, their captain told me that putting their hands on the ground past the ball was the same thing as playing it and that I needed to penalize the ball carrier for not releasing. That was a first for me. I told him what my standard was and consistently applied it. As much as we can agree to disagree, I was the one with the whistle and wasn’t about to change my standards 60 minutes into a match based on what I can only guess is a local variation or assumption that other refs don’t differentiate between hands on the ground and actually making a play on the ball. A close match for a change. Berkeley led until the final minutes on the fast pitch at Cal Maritime. Both teams were solid with marking the opposing backlines and sure tackling. No long, breakaway tries. Forwards kept possession going through multiple phases, though often giving up the ball through a knock-on. Spirited game that saw Berkeley claim a large win after a narrow defeat by the A side. After a brief mis-direction on the home field and the grateful assistance of Pete Smith I arrived at Maypark in Palo Alto in plenty of time to start the game at 13:00. Another warm day in March! Two very committed teams started the game well combining some direct close in ball carriers with wide moves to set the tone for the day. Both sides were guilty of going off their feet and also hands in ruck and early penalties were awarded. The sides quickly adjusted with some inputs from the coaches and the breakdown throughout the rest of the half was generally clean but well contested. Bulldogs physical strength was evident early on and throughout the game in general. Carries through the center of the breakdown areas delivered good ground and quick ball to hard running centers led to an early 12-0 lead. SFGG then had some territory but did not score and Bulldogs broke out for a converted try to lead 19-0. 25 mins played. SFGG got on the scoreboard with a penalty shortly after and on 35 mins scored another to trail 19-6. Having now got into the game the restart was not claimed with a few players looking at each other. This allowed Bulldogs to gather the bouncing ball and crash through for a converted try. 26-6 at halftime. The second half started with Bulldogs mounting the pressure and again their physical power lead to another try this time unconverted. 31-6. SFGG efforts then lead to their first try with some strong carries and offloads getting them past the strong Bulldogs defense. 31-11. Bulldogs reacted strongly and with some strong midfield running broke tackles for another converted try. 38-11 with 20 mins left. Bulldogs started to use their bench and SFGG picked up the pace chasing the game. The player change led to an increase in the Bulldogs breakdown infringements and after a team warning a yellow card was issued to the Bulldogs No 8 for repeat team infringements on 26 minutes. SFGG took advantage by kicking the penalty to the corner and with the man advantage drove the line out maul over for an unconverted try. 38-16. With the man advantage SFGG started to move the ball wide every time but a misjudged pass with an overlap in place was intercepted for a Bulldogs score. 45-16. SFGG got another score shortly after Bulldogs were back to 15 and Bulldogs closed out the match with a final try. Both were converted to leave the final score at 52-23. Both team played with structure, but San Jose could not match EPA’s athleticism and physicality. EPA lead 54-0 at half, and dominated the scoreboard, 16 tries to 2. Thanks to Jeff and Zane Jury for running AR and to Dave Williamson for giving some good pointers and advice. Love the enthusiasm the Highway men show with their version of the “Haka”, so did the whole City of Napa, very colorful gentlemen!!! Colusa struck first with quickness and strength as Google couldn’t get into a rhythm in the first half. The second half had Google in the try zone first and half as often as Colusa. A beautiful drop kick gave Google hope but the pesky Highway men would not give in. Thanks Bryant for the coaching! Eighty degrees in Napa where 14 Div 3 rugby clubs congregated for 7 league games and Napa hosting with Lagunitas IPA and BBQ by Up and Under. Our game kicked off at 3:00 and Reno quickly scored for a 7-0 lead. I think it surprised everyone when Mendo came back and scored three minutes later. At the 11 minute mark, it was 14-12, Reno. Heat had an effect and Reno took over. They proceeded to score 7 converted tries for a 49-12 halftime lead. You would think they must of all been center tries for their kicker, Greg, to be 7 for 7 on conversions; not the case. More of the same in the second half with Reno scoring 7 tries to Mendo’s two more. Good, clean game with everyone displaying great attitudes and playing hard rugby. And finally, at 5:00 iish, the beer and BBQ, in that order. Fun seeing all of the different refs and players. Good job Pete Smith and Napa RFC. Stanford v UCSB- On a sunny and clear day at Stueber Statium at the Stanford camps, the Cardinal dominated this game controlling every aspect of the game. They had some great kicks to pressure UCSB. UCSB didn’t have enough continuous play to reach the try zone. This opening round match-up between WSU and Cal under the hot Palo Alto sun. WSU donned their crimson red while Cal clad in classic colored hoops. The match began with plenty of jitters and subsequently many mishandling errors and scrums. After the first 15 minutes of the match, nerves calmed and smoother play was had. A blitz of scoring by both teams finished off the end of the first half, with WSU forcing their way in front. WSU 27 – Cal 10. The second half was even. Both teams only able to score two tries a piece. But the momentum had significantly swung in the favor of Cal. However time ran out for their comeback. Women’s Collegiate D1 Pacific Mountain playoffs at Stanford – this match UC Davis beat UC San Diego. Despite some early confusion regarding side entry laws, UC Davis was the more clinical side. Thanks to Paul Bretz and Paul Simko for assistance on the lines, and Paul Bretz for some good pointers and feedback. EDITOR’S NOTE: Gotta love an All-Paul support system. Napa Valley D3 Super Site. Super sites are a new idea this year (I think)-and an idea whose time has come. It has most of the advantages of your grandfather’s antediluvian tournament-food, drink, tees, lots of rugby to watch. It plays well to the sociability of rugby. D3? Most of it was pretty good. It is an opportunity for these hard working journeymen, these rugger lumpen proletarians, to strut, to show their stuff. And this all applies to refs also. One gets to see our peers in action, get feedback, catch up. A day with Dude? Priceless. EDITOR’S NOTE: Bryant Byrnes received a thesaurus for his birthday this year. Redwood flaked at the very last moment, so Humboldt stepped up on this sunny warm day. A good game-no wine and cheese at half for these guys. Each team had excellent scrum halves who played their own game within a game. Humboldt had a bigger, more physical pack; Modesto had two smallish outside backs who were faster than blazes. Fifteen minutes into the second half it was Modesto up 35 to 26. But then the two Modesto whippets went to work and scored four 60 meter plus tries under the posts. Few penalties, no cards; good sportsmanship, great fun. Life West started off hot and got hotter as the day went on. They were applying constant pressure until the Baracus team forced a turnover and raced the length of the field for a would be try, but with the try line 10M ahead the goal post the player touched the ball down behind the dead ball line. The line works both ways. Life West scored a try and at subsequent conversion I allowed the defending team to either stand on the try line and not advance or on the dead ball line where the goal posts are and charge. A Baracus player jumped straight up from the goal line (not advancing or breaking the plane of the goal line) and caught the conversion. the Life West kicker wasn’t happy, but I pointed out it was his field and it cost the other team 7 points on a centered try that ran out the back of the try zone 5 minutes prior. It was a more competitive game than the score would indicate. Life West has a strong team in general, but also some standout players that really put then over the top. Hats off to Baracus for playing hard for all 80 minutes and showing the true rugby spirit. It’s too darn hot for rugby. It feels like we should be playing 7s. Some would say that is a default state of being, but I still have a fondness for the traditional format of the game. Call me old-fashioned, and surely as I descend through my 40s that will inevitably become true. But there is still room for games like Saturday’s, between the upward-swinging Capitals, and the [precisely] 15 visitors from Chico, who were short-handed enough to require both their coach to play, and for the Caps to provide both TJs. Suffice it to say that from the off, Sacramento looked the better team. But that didn’t stop Chico from playing hard, even as their lineup grew progressively gimpier. In fact they managed to put across their 4th try mid-way through the second half to earn themselves a bonus point — just because you’re short-handed doesn’t mean you suddenly forgot how to play. Given the difference in score, I think the most notable moment came in the second half. It was the first time I’ve ever seen a direct-to-touch restart accepted. Lineout. Chico’s scrum was crumbling, so they took the best option. Still waiting for someone to take the re-kick — suspect that may be a while. At the end, Sacramento just fell short of the ton, and Chico hobbled off the field to find a beer. A B-side game was played where the Caps beat the Caps, refereed by a fellow funny-talker. Since there was no cheating of any kind, he was able to do this from the centre spot. Another rugby day in the books, and smiles all round as a result. An early game in San Jose at what used to be Blackford HS and a regular rugby location; the early start had the visitors straggling in with all their players only arriving about 30 minutes before the 9.15am kick off. The hosts got off to a good start with two tries before the visitors woke up. As the visitors woke up, their size and physicality started to bear down on the more experienced Seahawks who gave up a pair of tries. Half time saw a score of 14-12, with the difference being a single conversion. The second half was similar, with the more physical Life Women bashing through and the Seahawks responding with their experience. The Seahawks managed two more tries in response to Life’s three and a final score of 31 – 26 for the visiting Life West team. One of the mid afternoon matches at Napa set South Valley against San Francisco Fog. The score line does not indicate the fact that the match was close and well-contested from start to finish. South Valley led at half 38 – 7 but were outscored 20 – 15 in the second half, a testament to SF Fog determination. The game was a credit to both teams. Thank you to Lee Johnson for providing a helpful referee evaluation. This was the 11 AM match at Napa’s Kennedy Park between 2 teams both hurting for numbers as the season wears on. It gave me the opportunity to spend time checking out the all of the other matches & make 2 trips to the “party location” served by Napa’s airport shuttle bus. The Up & Under was there with its BBQ food (real good pulled pork sandwiches) all hosted by the Napa team (The Wine Thieves) who were great hosts throughout the day with not only 2 beautiful full grass fields but adding touch judges, players when necessary & great free beer for us refs. Pretty sure all 14 teams enjoyed themselves as well as the 7-8 refs & ref coaches in attendance. I would highly recommend this assignment next year. EDITOR’S NOTE: It is good to see a new report from our resident Aussie but there have been some complaints in the past that people couldn’t understand his accent, so I ran the report through a translator (Oz -> Murrican). I hope this helps – the translation is below the original report. Keep that billy boiling, Peter! ?????? pu? ?no ??o? o? ???? pu? s???no?? ?? ?s s?? ?o? ?uol?W ?? ?W o? s?u??? ????p ? ?u? ?q ?? ?o? su???l?? ?? s?oq ??? o? s?? ?q ??? ? ? ?o p,I ???? ?no ?u?od p?p ???o? ?uO ?no? ?u???ld?o? s????o? ? ?oq u??? ll?? p?p no? ?ou? no? ‘??? ? s? ???? o? ??ns??ld ? ?p??? ?sqo I ??? ?ds od??? dn u??l? ??? p?????? ????? ? ?ld lno? ?o? u???? ? ?l?u?d ?uo ?oN ? ?ooq o? ?u?lpu?? poo? ???? s?? ?q ??? u? p??ds ? ?os pu? ???? ?? ?od p????o? ? ?o uo???u?q?o? ? p?? ? ?oq pu? p?los ???? sll??s ? ?s?q ll? ????? ll? ?o? o? ?o? ?u?? o?? ‘? ?p ??? uo s???? p?????? ?lu??? ???? o?? ?? ?p ?l??ol ? pu? ‘u?? ?un ?l???l ? ???ql? ‘??? ?d ss??? ? ?sno??ol? s?? ?ln?? ?? pu? ,,? ?p l?? ?oN sno??ol? ????ou? uO,, ‘?u?? ?s ?o p???? ?u????? ?ou ?? I ‘s??????? ?u?? ???? s? As with many referees, I am not getting tired of saying, “On another glorious Nor Cal day” and it truly was glorious. A grass pitch, albeit a little uneven, and a lovely day. Two very evenly matched teams on the day, who went toe to toe all game. All basic skills were solid and both had a combination of a forward power game and some speed in the backs with good handling to boot. Not one penalty given for foul play which matched the clean up tempo spirit I observed. 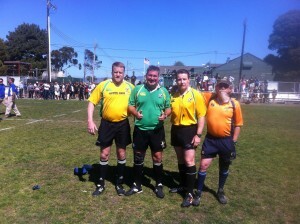 A pleasure to ref. As a ref, you know you did well when both coaches compliment you. One coach did point out that I’d owe a few beers to the boys at Pelicans for it being a draw. Thanks to Mike Malone for his sage thoughts and time to come out and watch. EDITOR’S NOTE: Looking forward to some VB stubbies at the next meeting. FINAL EDITOR’S NOTE: This single report has set a Hail Pelicus record for most editorial intrusions with 4, including this one. Another beautiful beach day in Santa Cruz, which means about 10 degrees too warm for a rugby match, in my opinion. University of Nevada-Reno scored first on an intercepted pass as UCSC attempted to run from their quarter. So it was 7-0 Wolfpack as the try was converted, and there would be many more to come in that first half, leading to a 38-0 lead by its end. The Banana Slugs were missing three players, two who had recent kitchen accidents involving knives at home while on spring break; one player cutting her thumb, the other dropping a knife on her foot (reminding me of Matt Cain’s and Jeremy Affeldt’s non-baseball injuries), and so they weren’t playing at full strength, especially at the inside center position. Nevada’s forwards beat UCSC’s to tackles and more often than not pirated balls from the home side’s ball carriers when they went to ground. UCSC did manage to counter ruck several times, but those moments of fighting for possession didn’t lead to much of a threat. Nevada played a complete game: running, kicking into space when that space was left unattended, and passing the ball about in movements that led to some well-deserved tries; and they tackled and wouldn’t let UCSC’s backs or forwards penetrate much into their own half, keeping up the pressure constantly. It might have made a difference if those three UCSC missing players were on the pitch, as they did score over 20 points in Reno earlier in the season, but they did give up a similar amount of points as well in that match then. The second half proved to be a tighter game. UCSC is a good team, and they weren’t going to stop fighting, so Nevada scored three converted tries that were spaced out amongst the 40 minutes. The visitors also subbed in a few players, anticipating another match against Humboldt State Sunday morning, and therefore giving some rest to those replaced. I was very impressed by Nevada’s outside center. She is a power to be reckoned with when she has the ball in space. And that brings me to my final comment: it was great to see a game played in somewhat of the older fashion of forwards from both sides committing to rucks and mauls and not playing this game based on rugby league of committing as few forwards as possible to the tackle situation that has come into fashion the last decade or so. It created space for the backs, as there weren’t so many forwards cluttering up the mid-field! When I left the parking lot my car’s thermometer was registering at 79F. I got home to Aptos where it was a cooler 72F. I was nostalgic about late March Saturdays of the past when it could have been raining or threatening rain, and it would have been chillier and windier up on the hill where that beautiful pitch is located. Oddly enough during this warmer than normal winter, the UCSC men’s team, exactly a month ago, played in the snow against Nevada Reno in Reno. On Sunday it felt like déjà vu. The colored overcome remained but the teams were reversed. Stanford was able to wear their home roaring red and WSU had to settle with grey, or was it gray? As the day before dictated a slow beginning, the next day could do nothing but continue. After both teams settled, scoring was afoot. Stanford lead at half 22 – 7 over WSU. As I would not fade and would not go down without a fight. In the second half the teams went try for try matching each other. Slugging out the physical second half against one another. When the final whistle blew on the weekend the score ended with Stanford 41 – WSU 22. The real take away is wear red in the playoffs. Central Washington v UC Davis. The game started close with Davis scoring the first try. Lots of offsides and ruck penalties but midway through the 1st half the game settled down. CWU had strong dynamic runners that could offload and make line breaks. UC Davis could not finish while CWU was able to finish their scoring opportunities better. Women’s Collegiate D1 Pacific Mountain playoffs at Stanford – this match Cal beat UC Santa Barbara. Mostly one-way traffic. Thanks to Paul Bretz for the coaching report and my first time using the SoloShot. Santa Cruz is an unlikely location for two teams from Reno and Humboldt to play, and less convenient for either team than it is for me to referee, but we were lucky to have these two strong teams here on the central coast for the West Coast Conference D2 women’s rugby playoffs. The pitch at UCSC was, as ever, in great shape and well prepared. Far below, the Monterey Bay lay shrouded in mist and haze despite the sunshine on the pitch. Humboldt opened the scoring ten minutes into this physical match, but were unable to extend their lead in the face of robust defense from Reno, so 5-0 it was at half time. Humboldt finally got their second try in the 63rd minute, after an earlier penalty kick, but Reno were not going to roll over in the face of a 13 point deficit with 17 minutes to play, and scored from a very well worked move sparked by their feisty scrum half. The successful conversion pulled Humboldt back to just 6 points lead with 10 minutes to play. Reno launched everything they had in pursuit of a decisive second score, but Humboldt built another period of sustained pressure in the final minutes of the game, once again building on strong incisive running from the backs to cross for another try to settle the match and take the championship. The travelling support for both teams enjoyed an exciting match with everything to play for until the very end. Congratulations to Meredith and her Humboldt State team, and all the best in the subsequent rounds of playoffs. This entry was posted in News on April 2, 2015 by James Hinkin.